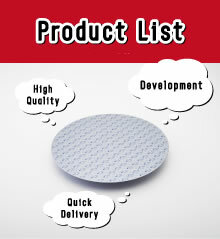 Selling of blanket wafers, patterned wafers for evaluation. Collecting and Recycling of used Si wafers. Selling of Ⅲ-Ⅴ wafers, Sapphire wafers, SiC wafers. Measurement services. for research and development of CMP, deposition, etching, and TSV. We change the type and thickness of the film of wafers on demand. ☆We are participating in 17th Packaging TECHNOLOGY EXPO ! Our Taiwan Office newly opened.